To Cite: Amir Heidari B, Badinloo S, Ohadi M, Dehghan Noudeh G. Bioencapsulation of Biosurfactant-Producing Bacillus subtilis (PTCC 1023) in Alginate Beads, Jundishapur J Nat Pharm Prod. 2016 ; 11(4):e33935. doi: 10.17795/jjnpp-33935. Background: Biosurfactants are amphipathic molecules that reduce surface tension. Cell encapsulation represents one of the current leading methodologies aimed at the delivery of the biological products. Alginate is one of the most frequently employed materials used for this purpose. Objectives: The aim of the present study was to evaluate the achievability of immobilizing Bacillus subtilis in calcium alginate beads to provide a concrete base for further process development of its biosurfactant production. Methods: Alginate and bacterial solutions were mixed by stirring to obtain a uniform mixture and added by drops into CaCl2 solution to form spherical beads. The spherical beads were agitated for two hours to harden. Equal numbers of beads were poured into 50 mL nutrient broth medium and incubated in the shaking incubator. Surface tension, emulsification activity, and foam production were measured every 24 hours. Results: B. subtilis showed hemolytic activity. Bead formation at concentrations of 3% and above showed the stability of the alginate solution, while in concentrations of 1% or less, it did not show proper stability. Ideal concentration of microbial suspension was achieved in 0.5 McFarland. Beads were the same size, spherical, and concurrent (3 - 4mm). Maximum foam stability, height, and bioemulsifier production were achieved at 24 hours’ incubation, while CMD values were minimal at this point. 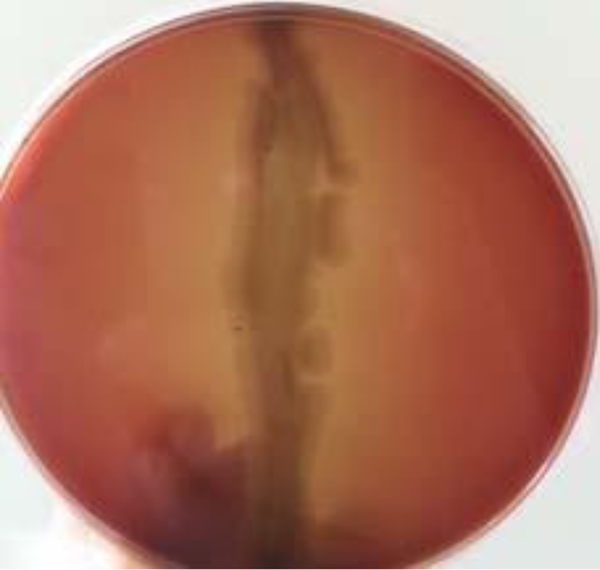 The growth of typical bacillial colonies was 250 - 300 CFU/bead. Conclusions: B. subtilis entrapped in beads was able to preserve its viability and produce biosurfactants as secondary metabolites. Therefore, this method could be applied as a continuous culture system of biosurfactant production. Biosurfactants are amphiphilic compounds that confer the ability to accumulate between fluid phases, causing reduced surface and interfacial tension of the samples (1). They are a structurally diverse group of surface-active molecules synthesized by microorganisms (2). They have been applied as an improved alternative to chemical surfactants, especially in the food, pharmaceutical, and oil industries within the past five decades (3). Biosurfactants are produced by a wide variety of bacteria, yeast, and filamentous fungi (4). Bacillus spp. has been used in the biological control of plant diseases. It secretes a broad spectrum of bioactive peptides, with great potential for biotechnological and biopharmaceutical application (3). Biosurfactants have had a significant effect on medicine, including tissue engineering, dental implants, wound dressings, and drug delivery. Alginate is a natural polymer used in the food and pharmaceutical industries because of its mild gelling, biocompatibility, and biodegradability properties. There has been an increasing interest in using alginate in a wide range of scientific fields, such as oral vaccination, development of controlled-release systems for conventional drugs and peptides, and cell microencapsulation for the controlled and continuous delivery of therapeutic products. Modification of biotechnology and processes using immobilized biocatalysts has recently gained the attention of many biotechnologists. Application of immobilized enzymes or whole cells is advantageous, because such biocatalysts display better operational stability and higher efficiency of catalysis. Thus, they are reusable. Microbial products are usually produced either by free or immobilized cells. The use of immobilized cells as industrial catalysts can be advantageous compared to the batch fermentation process (5). 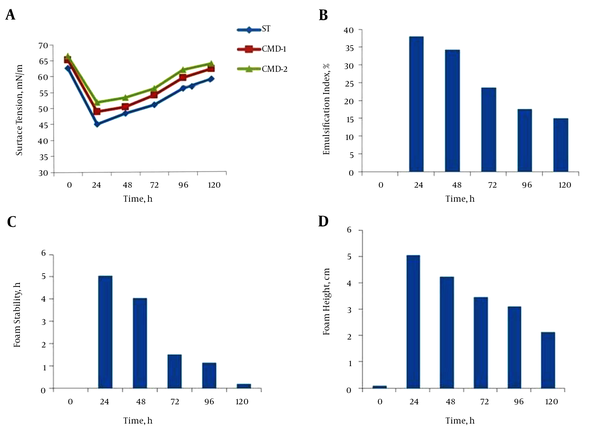 In this study, we evaluated the potential of immobilization of B. subtilis in calcium alginate beads and releasing of the biosurfactant from the immobilized beads. The surface tension, emulsification index, foam stability, and foam height in three conditions (free cell, after encapsulation, and after exchanging culture media) were measured. Materials were purchased from Merck Company, unless stated otherwise. B. subtilis PTCC 1023 was purchased from the Persian Type Culture Collection, Tehran, Iran. B. subtilis PTCC 1023 was grown in 250 mL flasks, each containing 50 mL nutrient broth (NB) medium incubated in a shaker (DK-S1020) at 37°C and 250 rpm. Samples were withdrawn every 24 hours to analyze the surface activity, emulsification index, and foam activity. This process was continued up to 120 hours, and all measurements were done on the supernatant obtained after centrifuging the liquid culture (6-8). B. subtilis PTCC 1023 was subcultured on blood agar plates containing 5% (v/v) blood and incubated at 37°C for 48 hours. Hemolytic activity was detected as the presence of a definite clear zone around the colonies (9). Sodium alginate solution in different concentrations 1, 2, 3, and 4% (w/v) was prepared by dissolving sodium alginate in 100 mL boiling water and sterilizing by autoclave. The solution was placed by drops into calcium chloride 4% (w/v) solution under agitation conditions for two hours to harden and wash it (4, 5). The formed beads were moved to flasks containing NB medium and incubated in a shaker at 37°C and 250 rpm for 120 hours. The size, shape, and stability of the beads were evaluated visually at definite time intervals (every 24 hours). Bacterial cells were harvested by centrifugation at 8,000 rpm for 20 minutes at 37°C and washed with normal saline (10). Bacterial suspensions with different dilutions were prepared in order to evaluate the concentration suitable for encapsulation. Alginate solutions were mixed with bacterial suspensions under agitation conditions for ten minutes to obtain a uniform mixture. The slurry was taken into a sterile syringe and added drop-wise into a stirring 2% calcium chloride solution from a height of 5 cm. The spherical formed beads were kept under agitation for approximately two hours to harden, and then they were washed (4). Equal numbers of beads were transferred to 250 mL Erlenmeyer flasks, each containing 50 mL nutrient broth medium. The flasks were incubated at 37°C in a shaker incubator at 250 rpm, and every 24 hours, surface activity, emulsification index, and foam activity were analyzed. This process was continued up to 120 hours, and all measurements were done on the supernatant obtained from the liquid culture containing the beads. 20 mL of supernatant was poured into a glass beaker (50 mL) and placed onto the tensiometer (KRUSS-K100) platform. Between each measurement, the platinum-iridium ring was rinsed three times with water and acetone and allowed to dry (10). All measurements were made on bead-free broth. Negative control consisted of sterile culture medium without B. subtilis (PTCC 1023), at zero time. The emulsification index (E24) was calculated by dividing the height of the emulsified layer (mm) by the total height of the liquid column (mm) according to Cooper et al. (11) and Wei et al. (12). An equal volume (5 mL) of mineral oil and supernatant was mixed in a graduated tube by vortexing (3,000 rpm for two minutes); after 24 hours of incubation of the immobilized cells, measurements were taken. Foaming activity was detected as the duration of foam and foam height in the graduated cylinder (13, 14). A volume of 5 mL of supernatant was withdrawn every 24 hours, after vortexing for one minute at the high speed, at which time the foam activity measurement was taken. To determine the encapsulation efficiency, 20 prepared beads were treated with 20 mL of sodium citrate, 55 mM solutions, and stirred magnetically for five minutes at room temperature. Beads were de-gelled via the exchange of calcium ions by sodium ions. The number of entrapped cells after adequate dilution was measured by the pour plate method, and counts were expressed as the number of colony forming units (CFU) (5). In this study, hemolytic activity was evaluated as a potential predictor of surfactant-producing bacteria. B. subtilis was isolated from nutrient agar cultures and tested by hemolytic method. The strain showed hemolytic activity (Figure 1). Bead formation was practiced with different concentrations of sodium alginate and calcium chloride. It was observed that at concentrations of 3% and above, the viscosity of alginate solution caused a stripe-like exit from the syringe. This, in addition to the difficulty caused, resulted in non-spherical and non-uniform calcium alginate bodies. On the other hand, beads formed from concentrations of 1% or less did not show proper stability. Thus, further experimentation was carried out using 2% as the chosen concentration. The ideal concentration of microbial suspension was achieved when a concentration equal to 0.5 McFarland standard was serially diluted twice (in every diluting, 10 µL of microbial suspension was diluted with 10 mL of normal saline); concentrations above this caused the beads to rupture. Under incubation conditions in the shaker incubator (37°C, 250 rpm, 120 hours), selected beads were stable, and no rupture was seen over 24 hours. Formed beads were almost the same size, spherical, and concurrent. The diameter of the beads in this experiment was 3 - 4 mm (Figure 2). The parameters of biosurfactant production, such as surface tension, emulsification index, foam stability, and foam height were measured in three conditions: free cell, after encapsulation, and after exchanging culture media. 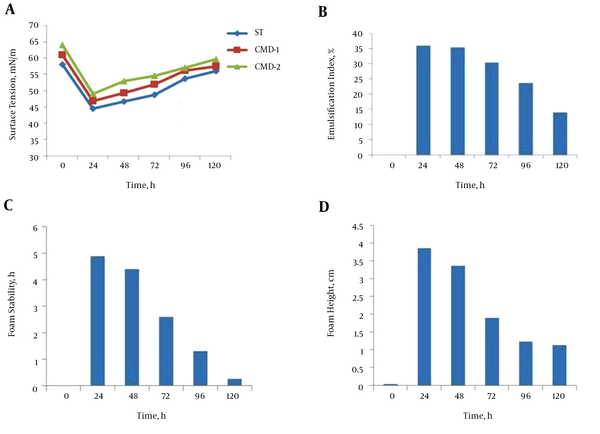 As shown in Figure 3A, maximum biosurfactant production was achieved during 24 hours’ incubation, and CMD values followed this pattern in the free cell. Thus, it can be supposed that, while surface tension was minimal, biosurfactant production by the microorganism was maximal. The emulsification index of the supernatant of B. subtilis in nutrient broth was measured, and a maximum E24 value was observed after 24 hours of incubation (Figure 3B). Maximum foam stability and foam height were achieved in 24 hours of incubation. These factors were decreased over time beyond 24 hours (Figure 3C and D). Beads containing B. subtilis were cultured in NB and surface tension lowering continued until 24 hours of growth. Maximum bioemulsifier production was achieved in 24 hours of incubation, and CMD values were minimal at this point. According to the surface tension, the profile of the supernatant, and CMD values shown in Figure 4A, it can be supposed that, while surface tension was minimal, biosurfactant production was maximal. Hence, this time was chosen as optimum for biosurfactant production. The effect of immobilization on the emulsification index of the supernatant of the beads containing B. subtilis in NB is shown in Figure 4B. Results showed an increase in incubation time causes an improvement in E24 and, at the first 24 hours of incubation, this index was maximum and followed a descending pattern until 120 hours. Results also revealed that there is a rational correlation between the surface activity and emulsification index (Figure 4A and B). While the surface tension of the supernatant was lowest, the emulsification index was raised to maximum. Therefore, 24 hours of incubation was considered best for biosurfactant production. Results showed the maximum foam height and foam stability of the supernatant of beads containing B. subtilis after 24 hours’ incubation (Figure 4C and D). Surface tension profile (A), emulsification index profile (B), foam stability (C), foam height (D). Biosurfactant concentration is expressed in terms of critical micelle dilution (CMD). This was calculated by measuring the surface tension for different concentrations with a duNouy Tensiometer. 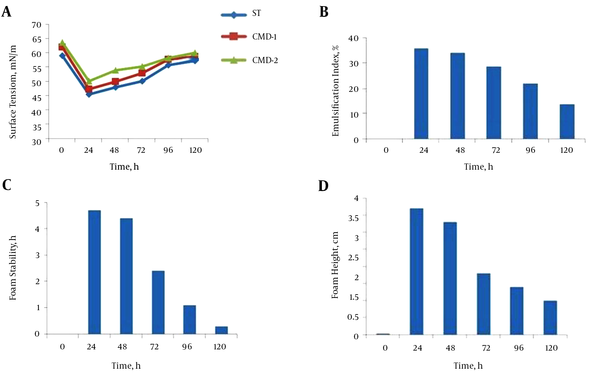 CMD-1(critical micelle dilution)-1 and CMD-2 (critical micelle dilution)-2 measurements were performed by measuring the surface tension of 10-times and 100-times diluted cell-free broth (9). 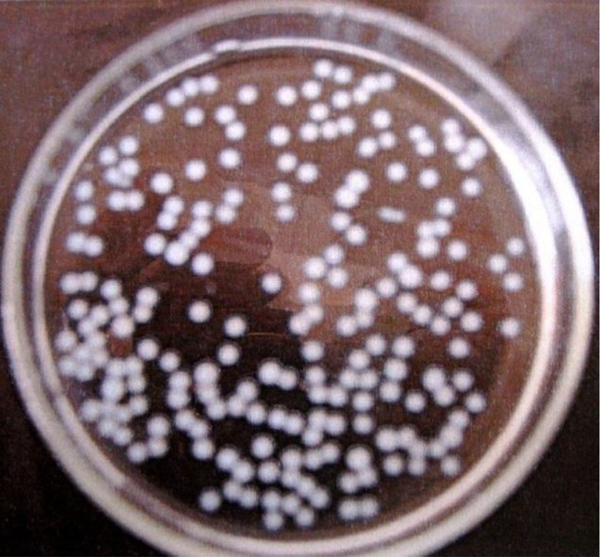 After exchanging culture medium, encapsulated B. subtilis in alginate beads continued to produce biosurfactant. Lowering surface tension continued during the first 24 hours after exchanging the culture medium and followed a similar pattern to the first period of culture. The same profiles were observed for CMD-1 and CMD-2 (Figure 5A). The E24 plot, as shown in Figure 5B, a measure of the biosurfactant concentration, showed that within 24 hours of exchanging the medium, the emulsification index started to increase. Measuring foam stability and foam height of the supernatant-containing beads also proved biosurfactant production after exchanging the medium (Figure 5C and D). After 24 hours’ incubation of bead lysate on nutrient agar plates, growth of typical bacillial colonies of B. subtilis was observed, and a count of 250 - 300 CFU/bead was calculated. The results pertaining to encapsulation efficiency indicated that there was no considerable loss of viability for all prepared beads. Biosurfactants are amphipilic compounds with both hydrophilic and hydrophobic moieties (mostly hydrocarbons), which are able to display a variety of surface activities that, among other roles, help solubilize hydrophobic substrates (6). They are expected to have many advantages, such as industrial and environmental applications (3). In this study, we investigated the production of the biosurfactant by B. subtilis in its immobilized cells with alginate beads and the possibility of a continuous culture system of biosurfactant production. Bacilli are recognized as biosurfactant-producing bacteria. For example, lipopeptide biosurfactant, produced by B. subtilis with hemolytic activity, is directly related to its biosurfactant properties (15). The successful commercialization of every biotechnological product depends largely on its bioprocess economics. Therefore, in the production of the commercially viable biosurfactants, process optimization at the biological and engineering levels needs to be improved. In this regard, cell encapsulation represents one of the current leading methodologies aimed at bioprocess development. In addition to its various benefits, beading bacteria in a diffusible polymeric matrix prevents the need for frequent biocatalyst preparation, paves the way for continuous fermentation, and facilitates downstream processing of bio-products. On the other hand, by immobilizing microorganisms, a better study would be possible of the factors that affect the desired product and bring out its many advantages, e. g., no need for preparation of inoculum, convenience of product refining, and time and money savings (5, 16, 17). Alginate is the most frequently employed material used to entrap the eukaryotic and prokaryotic cells, due to its mild gelling, biocompatibility, and biodegradability properties (5). Calcium alginate entrapment was defined as a promising immobilization method of B. licheniformis KBR6 for repeated tannase production. Tannase production by immobilized cells is superior to that of free cells, because it leads to higher volumetric activities within the same period of fermentation (16). Mohapatra et al. (18) evaluated production of alkaline protease with immobilized cells of Bacillus subtilis PE-11 in various matrixes and concluded that immobilized cells of B. subtilis PE-11 in calcium alginate can be proposed as an effective biocatalyst in repeated usage for maximum production of alkaline protease. At the laboratory scale, entrapment of these viable cells was successful; the cells survived and preserved their productivity. Therefore, it could be claimed that a constructive step toward the process development of the desired product was taken.